on November 14, 2018, 10:53 a.m. 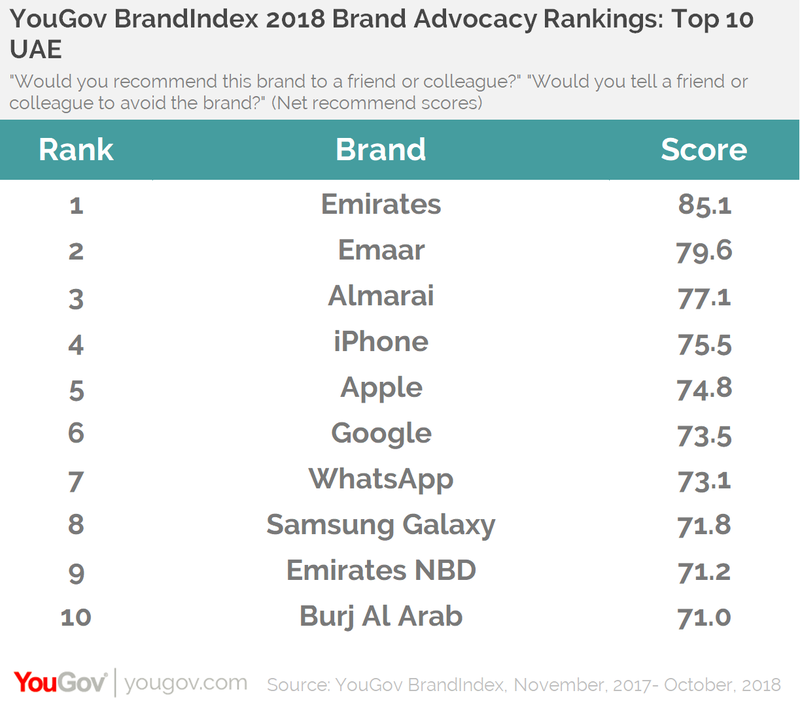 The UAE’s flag carrier airline Emirates, real estate company Emaar and smartphone giant iPhone are the most recommended brands by consumers in the UAE, Saudi Arabia and Egypt, respectively. While the rankings in the UAE and Egypt are dominated by digital and technology brands, Saudi’s top ten rankings showcase a mix of travel, real estate, consumer brands and financial services. 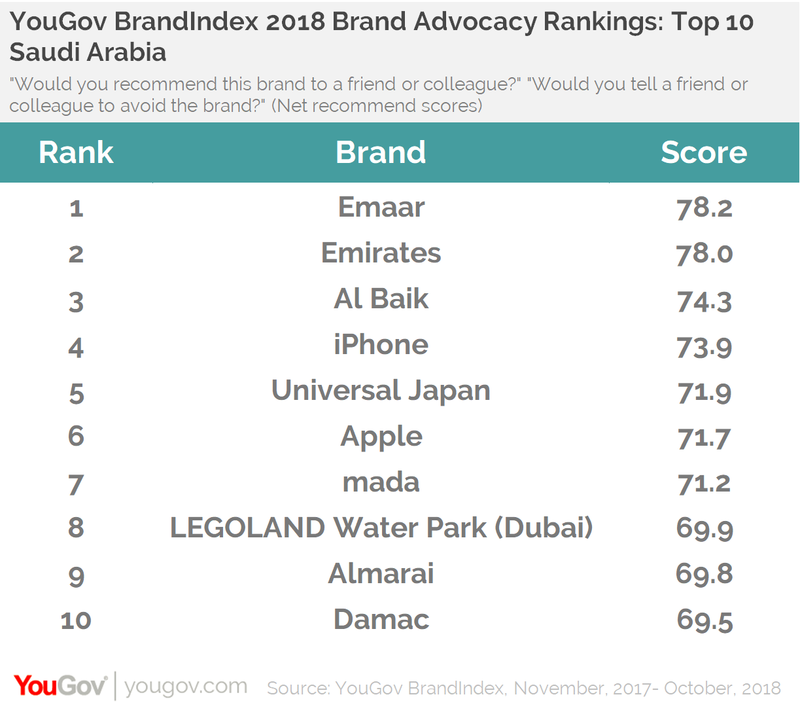 After Emirates, Emaar and Almarai are the most endorsed brands by consumers in the UAE, at number two and three, respectively. In Saudi Arabia, Emaar raced up to the top spot from number five last year, and is now closely followed by Emirates and then Al Baik. However, in Egypt, iPhone remains unchallenged at the top of the rankings, proving to be the worthiest of customer advocacy in the country. Netflix makes an impressive entry into the rankings at number two and Google has moved up to the third spot this year from number four last year. 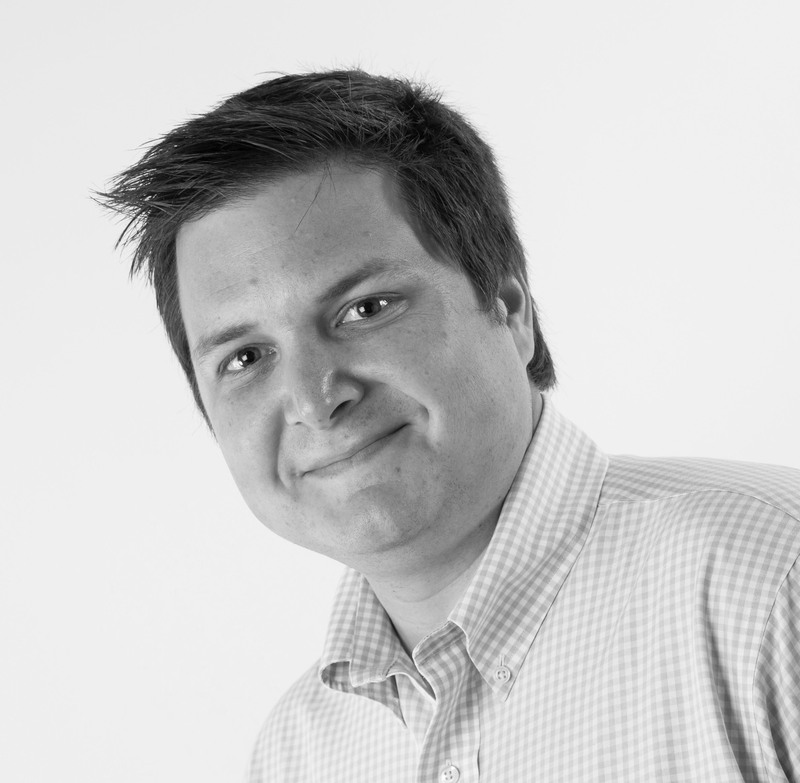 YouGov also revealed brands that have the most improved level of customer advocacy over the last twelve months. Pakistan International Airlines has seen the biggest improvement in its Recommend score in the UAE and Kia and Heinz have seen the greatest uplift in their scores in Saudi Arabia and Egypt, respectively. 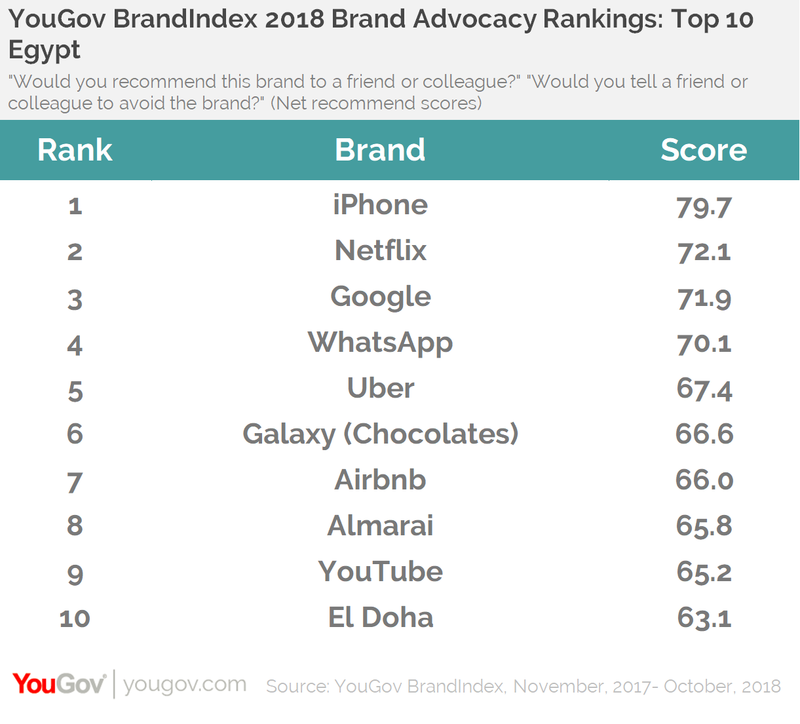 YouGov BrandIndex screened 548 brands in the UAE, 288 brands in Egypt and 497 brands in Saudi Arabia for their net Recommend score, which asks respondents "Would you recommend the brand to a friend or colleague?" and “Would you tell a friend or colleague to avoid the brand?” Only respondents who are current or former customers of a given brand are considered. Rankings data was collected between November 1, 2017 and October 31, 2018 and Improvers data was collected between November 1, 2016 and October 31, 2018. All brands must have a minimum N of 200 and have been tracked for at least 6 months to be included in the rankings and at least 6 months in the prior year's period (as well as being currently tracked) to be included among improvers.